BoyleSports is an established Irish sports betting company. Their brand is well known to most of the punters but at the same time it's definitely not as recognized as likes of Ladbrokes, William Hill, Paddy Power or bet365. They are licensed in the Isle of Man but also hold a UK Gambling Commission licence so you can play with them freely from both UK and Ireland. New offer from BoyleSports is a good one for punters who want something more than just an usual free bet. Yes, you get a £10 free bet on your first bet. However there is more to that. After getting your initial free bet up to £10 you can get three more. Each free bet will be awarded after placing three normal bets. The value of free bet will match the average stake of those 3 initial bets. It won't exceed £10. The offer is valid for UK customers and minimal stake of each bet is 1/2 (1.50). Offer valid from 5th March 2017. The bookmaker used to offer a £20 free bet as the welcome offer for all new customers from the UK and Ireland. You had to deposit at least £10 and place a bet of the same amount. Once your bet was placed you would receive four free bets of £5 each. You can double your odds if your first goalscorer bet gets in within the first 20 minutes of the game. This promotion is available only on Premier League games but is a really nice one. Apart from that they for example offer an acca promo on NFL – if you place a 5-fold or bigger NFL accumulator and just one leg lets you down you will get your money back as a free bet. The horse racing offering from BoyleSports is really comprehensive. They offer odds on a wide range of markets for horseracing, and the variety and range of promotions they offer is right up there with their industry rivals. What is more they guarantee to pay out on the highest odds. So if your starting price with them is lower than any big competitor they will pay out on higher odds. What is more if your horse is a non-runner you will get your money back. Boylesports are also running an excellent promotion called ‘Free Fall' for the National Hunt racing season. On all UK and Irish jumps races they will give you your money back as a free bet if your horse falls at the first OR last fence. This is a brilliant offer, and it is well worth considering when deciding which bookmaker is the right one for you. That's a really nice mix of promotions for horse racing fans! This bookmaker covers most of the interesting football leagues and cups. Their product is really good in this area and what is more they often run various promotions. One very popular football promotion often offered by Boylesports is their ‘Double Odds If Crossbar Is Hit'. This means that if a team hits the crossbar, they will double your winnings in the form of a free bet. They will also refund your losing stake if one leg of your 5+ team acca lets you down. And, if every team in your winning 5+ team acca scores, they will double your winnings. They have a dedicated in play section where their coverage is also quite impressive. BoyleSports is among the market leaders when it comes to the football betting. When it comes to football promotions and offers, they are up their with the best too. 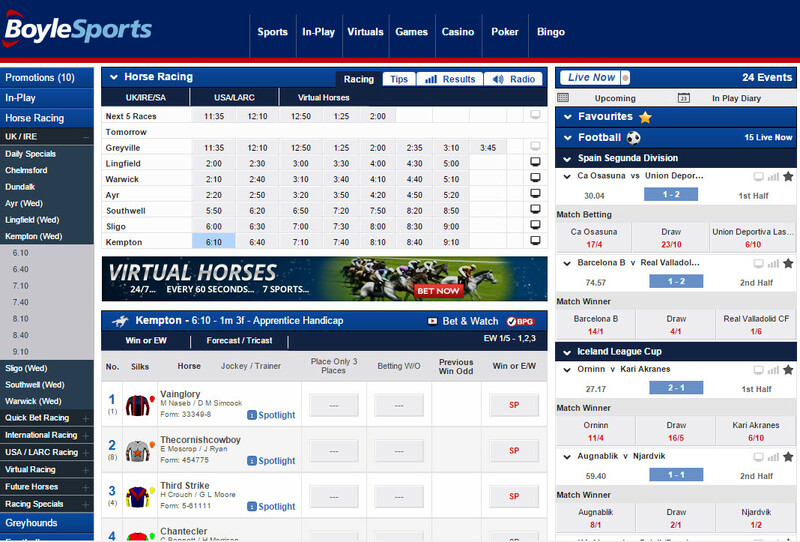 For punters who prefer to concentrate on the horses, Boylesports is a bookmaker well worth checking out. They offer all the usual markets, including win, each way and forecasts/tricasts. As an added bonus, they also offer ‘place only’betting, as well as ‘betting without the fav’. Unlike some other big name bookmakers, Boylesports have the rights to stream races from every race track in both Britain and Ireland. All you need to do to watch the race, is place a bet of just £1 on the race you want to see. They have the latest form figures for every horse, and they also have ‘spotlight’ previews from the Racing Post. As was outlined earlier they are best odds guaranteed on horse racing (and dogs). If you take a price on a horse, and it wins at bigger odds, you will get paid at the bigger price. When it comes to betting on the horses, Boylesports are a bookie that is up there with the very best. Boylesports offer a wide range of markets on all the biggest tennis tournaments and matches. They have every ATP, WTA and ITF match covered, and they offer in play betting on tennis matches too. Televised matches have the most markets available to punt on, and you can bet on individual sets, total games (over/under) and correct scores. Other bookmakers, like Bet365 for example, have more markets available but if you like to keep your tennis betting simple, Boylesports has everything you need. Apart from football and horse racing BoyleSports is quite strong when it comes to American sports. They have good odds and wide offering for NFL, NBA, NHL and NFL. They also do a good job for major golf tournaments. Just for example they run a promotion in which they pay out as winning bets if your selected player finishes 2nd or 3rd. If you are a fan of boxing or MMA, Boylesports is well worth checking out. Their prices on all the big fights are usually very competitive, and they often offer promotions for the biggest fights of all. For example, for the Bellew v Haye fight they will be offering money back if the fight ends in the first round. 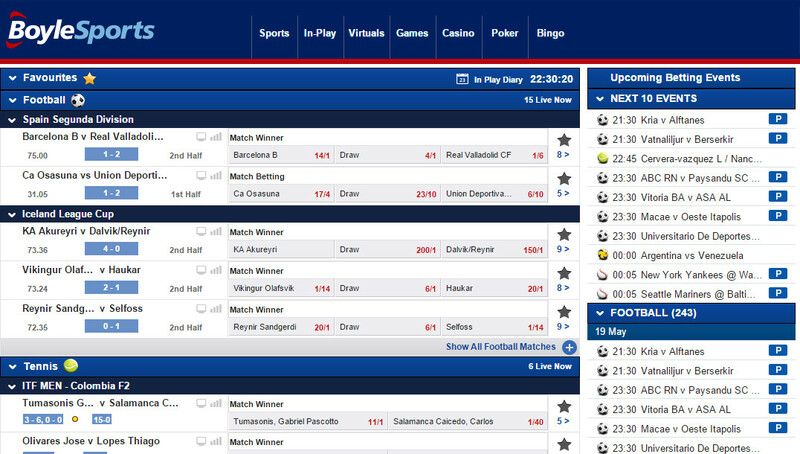 BoyleSports website can be liked or hated but for us it's a really decent one. On the first view it looks a bit busy and maybe chaotic. However when you click through it it really shows up that basically all parts are really needed and make life of a punter much easier. Starting from the very top they have quick links to mobile and tablet download, services and odds format. The navigation menu is also quite good. We especially like the fact the promotions section is clearly visible and with just one click you can get a good overview on what you can use. Apart from that live betting is also nicely visible just as some featured events that most of the punters will find interesting. In general really good site. 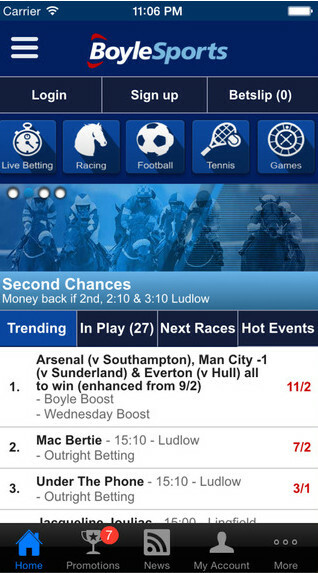 The Mobile App is another reason for signing up with Boylesports. This is one of the best Apps around, in our opinion, and it works smoothly and is easy to use. The main betting events are located in a handy menu at the top of the screen, giving you quick access to whatever it is you wish to bet on. We love how all the current ‘in play' events are listed on the landing page, and for in running punters this is very useful. You can also cash out via the mobile app, and that button is also located in the top menu. Mobile offering from BoyleSports is also quite decent. It's easy to navigate and find the betting markets you are interested. What is more they also make the promotions section easily visible so you can easily get an idea what you can take the advantage of there. .
BoyleSports offers customer service through email, phone, live chat and twitter account @boylecare. Their customer service is prompt and courteous, and they deal with any issues in an efficient manner. Boyles support all popular payment methods: Visa, Mastercard, Maestro, Laser, Moneybookers (Skrill), Neteller, PayPal and bank transfer. Minimum deposit with all is £5. BoyleSports might not be the most recognized betting company in the UK but it's definitely an established and truster company. They are based in Ireland and just like their biggest competitor from there they offer a really good product. Their football, horse racing and american sports offering is probably their main strengths. On top of that they also run a lot of various promotions. Their site is a nice one and have quite a few interesting features. Same applies to their mobile offering. In general BoyleSports is a company that we can definitely recommend.